The Great Day in Harlem photo - which of them did you see live? the winner gets a prize. I've only seen two in person, the two who happen to be the last men standing today, Benny Golson and Sony Rollins. Coincidentally, both are tenor players. Johnny Griffin, Sonny Rollins, Mary Lou Williams, Milt Hinton, Dizzy Gillespie, Count Basie. And maybe Jo Jones, but I'm no longer sure. Only a few for me as well: Sonny Rollins, Marian McPartland, Art Farmer, Johnny Griffin and Hank Jones. I saw 14. Art Farmer, Benny Golson, Monk, Sonny, Art Blakey, Milt Hinton, Lawrence Brown, Dizzy, Count Basie, Mary Lou, Horace Silver, Mingus, Gerry Mulligan and Willie the Lion. I was about to say "none" -- but then I remembered I did catch Sonny Rollins in Kansas City -- back in the very late 90's, iirc. But I think that's it, for me. Having gotten into Jazz late (mid 90’s) I’ve unfortunately seen none of them. Though I have seen artists from that era that are not pictured. I've seen 6 and just missed a few others. Golson, Farmer, Blakey, Griffin, H. Jones, Rollins and Gillespie. Wish there were more.. Probably also caught Milt Hinton, will have to check. Ernie Wilkins as well I think. I have Hawk’s, Jimmy Jones’ and Horace’s autographs, if that counts? Because of my age, I was around long enough to see a large number of these musicians live. I counted 38 that I definitely have seen, and there are a few more that I may have seen long ago but can't recall with certainty. Diz, Bu, Monk, Buck Clayton, Charlie Mingus, Bud Freeman, Pee Wee Russell, Jimmy Rushing, Jo Jones. Mingus, Gillespie, Benny Golson, Art Farmer, Blakey, Horace Silver, Rollins, Gerry Mulligan. 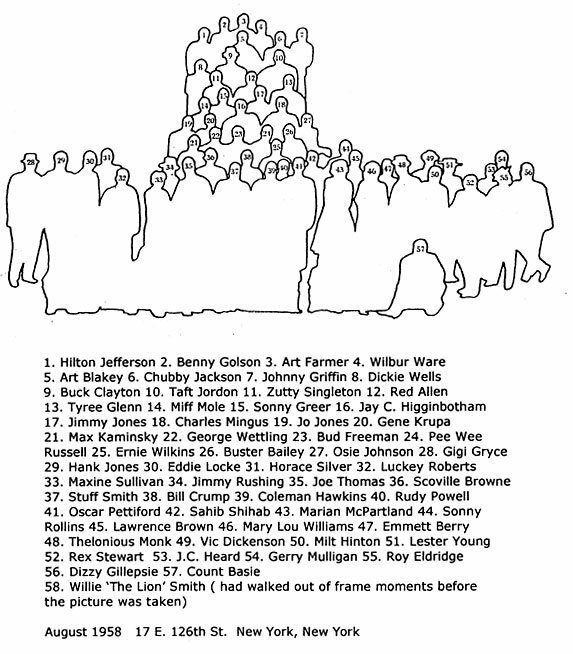 Gosh -- I have probably seen more musicians from that era that weren't pictured there that day: Jimmy Smith, Lou Donaldson, Clark Terry, George Shearing, Milt Jackson, Ray Brown, Oscar Peterson, Dorothy Donegan, Stanley Turrentine, Ray Charles, Louie Bellson, Buddy Rich, Junior Mance, Dave Brubeck, Ernie Andrews, Jay McShann and Kenny Burrell for starters. I guess some of them must have had an out-of-town gig that day. Blakey (twice), McPartland, Rollins (twice). I was scheduled to see Dizzy at Penn's Landing in 1992, but he was ill, and the band functioned as a tribute band instead. Still remember the trumpet section - Jon Faddis and Freddie Hubbard, who were egging each other on, and Wynton Marsalis, who was having none of it. Marian McPartland (many times), Milt Hinton and Sonny Rollins. I would have seen Dizzy Gillespie back in the 1980s but his outdoor set was rained out. I interviewed Marian McPartland, Milt Hinton, Sonny Rollins, Gerry Mulligan, Art Farmer, Benny Golson and Horace Silver. 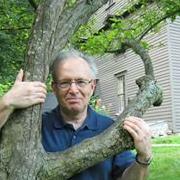 I wonder if anyone on this website ever saw Bill Crump play? Was it a train wreck? I love Williams. but doesn't seem like Taylor did. 28 or so. Not sure about Rex Stewart. Like you, I've seen only the two who are still alive--Rollins (1999 in Indianapolis) and Golson (2004 in Indianapolis). There was a prior discussion on the board about this. Some said that the rhythm section was imposed on Cecil, that he wanted a more progressive bassist or drummer. The results were...indescribable. Taken as a trio, Mary Lou was great, but then there's this guy on the other end of the stage... Anyway, hear it for yourself if you dare! It's worth it just for the high concept of seeing Cecil Taylor on Pablo. 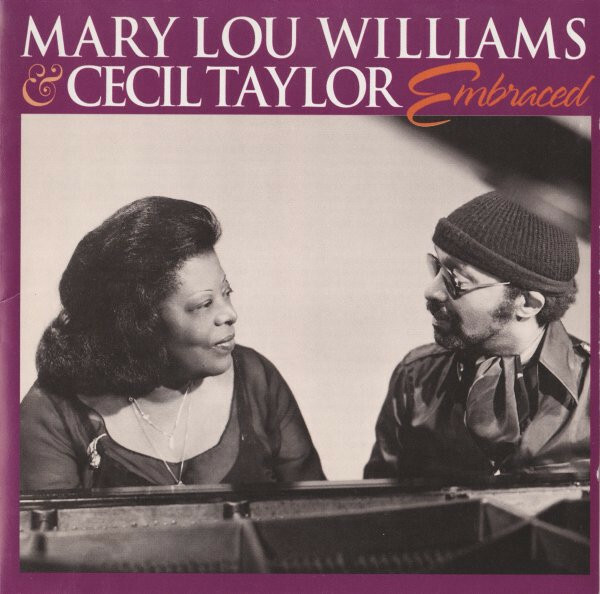 Though it should have been called "Mary Lou Williams Meets Cecil Taylor," or "The Mary Lou Williams And Cecil Taylor Quartet," or "The Ebullient Mary Lou And Cecil...Together!" or maybe "Cecil Taylor Sits In With The Mary Lou Williams Trio." Wow! Must be a record. I am old enough by now to have seen and heard about half of those Giants.